How can our movement habits create pain and decrease our ability to move well? We get good at what we repeatedly do, that is how our brain learns, through repetition. We will get good at things we do intentionally AND things we do unintentionally. If we repeatedly stand in a certain way or walk in a certain way, eventually that way will become learned and automatic. When it becomes automatic we are no longer conscious of it. It becomes our ‘normal’. The Green Light Reflex is the reflex that drives us forward into the world. It is an inherently positive reflex. Without it we would never have learned to crawl or walk. However, every time your phone rings, someone calls your name, a deadline looms, you rush to be on time, the bodily response is the same, your Green Light Reflex is triggered. All the muscles of the Green Light Reflex contracting, to ready you for action. In modern society, most people have very busy lifestyles and are constantly under demand from their jobs, children, emails, phone calls, text messages, social activities, hobbies etc. This constant triggering of the Green Light Reflex, leads to habitually and chronically tightened back muscles in exactly the way described by Thomas Hanna in the quote above. Your ‘normal’ becomes a learned state of contraction, always ready for action and unable to relax fully. You develop Sensory Motor Amnesia (SMA), forgetting how to release and relax all the musculature of the back of the body. A stiff, sore back and reduced ability to move freely becomes inevitable at this point. The Red Light Reflex is the complete opposite of the Green Light Reflex. It is a withdrawal reflex, a tightening of all the front of the body in an attempt to make ourselves small and hideaway from fear or danger. Red Light is triggered by fear, danger or threat, .ie when we hear a loud noise, or someone yells ‘duck!’. It can equally be caused by spending too much time slumped in front of a laptop, tv, tablet or smartphone. Nowadays this seems to be a major cause of Red Light Reflex. Many hours with our heads pointed down, back rounded and our shoulders slumped forward gazing at our ever smaller screens (PCs > laptops > tablets > smartphones). If we spend a lot of time in this position, or under threat, we are essentially learning how to stay in that position. Belly tight, hip flexors tight, shoulders forward, head down. Again this state of learned contraction becomes our new ‘normal’. And while it is very useful for looking at gadgets or working at a screen, it is not so useful when we want to do something (anything) else. Eventually, you develop Sensory Motor Amnesia (SMA), forgetting how to release and relax all the musculature of the front of the body. A stiff, sore neck and shoulders and reduced ability to breathe deepy and move freely becomes inevitable at this point. 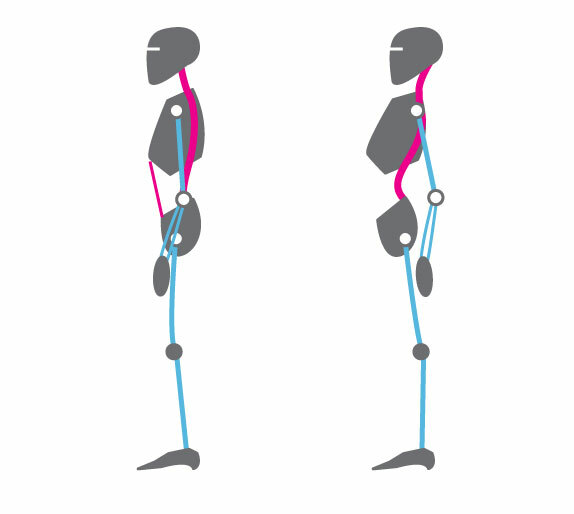 We can habituate any posture or movement pattern that we use regularly, whether it is helpful or not. Think about it, do you always sit in the same chair in your living room? In the same position? It just feels comfortable right? Well that’s because you have unintentionally learned to sit in that way. It’s an example of habituation. Do you always carry your infant on the same side hip? Habituation. When you drive do you always sink into one side? Or put your elbow on the centre console? Habituation. When you stand do you always cross your arms? Or your legs? Or lean into one side? How do you walk? Always wear your bag on the same side? Again these are all habituations. One sided habits can lead to Trauma Reflex. Much of what we do each and every day is automatic and performed unconsciously. But some of these movement habits may be causing you to have pain due to the constant contraction of the muscles involved. Becoming aware of our movement habits can help us to identify which ones may be causing us to have pain or reducing our ability to move well. Once identified, Somatic Exercises or Clinical Somatics Lessons can help us to release these habituated patterns of muscular contraction for less pain, more self awareness and more freedom of movement. In this post, I described The Green Light Reflex. When this reflex becomes habituated, it can often cause back pain, particularly in the low back. But how does the Green Light Reflex cause back pain? When the thick strong muscles of the spine, known collectively as paravertebrals, are involuntarily stuck in contraction (SMA) they draw the spinal vertebra closer together, this causes the lower back to arch forward excessively. This is often referred to as lordosis, or lordotic posture. It is easily identified by a lower back that is pulled to the front, it also makes the belly protrude and tilts the pelvis anteriorly. When these paravertebrals are stuck in contraction, they will make any type of forward bending action more difficult. In order to bend forward freely, you must be able to relax and lengthen all the muscles along the back of the spine. If you cannot voluntarily relax and lengthen these muscles you have what we call in Clinical Somatic Education, Sensory Motor Amnesia (SMA). Paravertebrals (the muscles running either side along the length of the spine) that are habitually contracted pull the vertebra (bones of the spine) closer together. This can compress any or all of the nerves that exit the spinal cord in the lumbar area or any other area of the back, leading to trapped nerves, sciatica or similar complaints. This compression of the spinal vertebra can also create a situation where the intervertebral discs that are supposed to act as shock absorbers between each vertebra, are pushed out of place leading to bulging/herniated discs. This spinal compression is also what causes “wear & tear” in the lumbar spine. Even if you don’t have nerve pain or bulging discs from habituated Green Light Reflex, the constant contraction of the paravertebrals leads to fatigue and aching muscles in the back. So an habituated Green Light Reflex can be the cause of several problems from a reduction in mobility all the way to herniated discs. Each of these problems occur along a spectrum of Green Light Reflex. At the low end of the scale, .ie minimal green light reflex you might expect to have reduced forward bending ability, and at the high end of the scale you might expect, tension headaches, chronic pain and bulging or herniated discs. These are not the only issues that can occur as a result of habituated Green Light Reflex. It can also lead to tension headaches, neck pain, shoulder pain, tight hips, hamstrings and calves, knee pain and other issues. But the mechanism by which these problems occurs is the same. 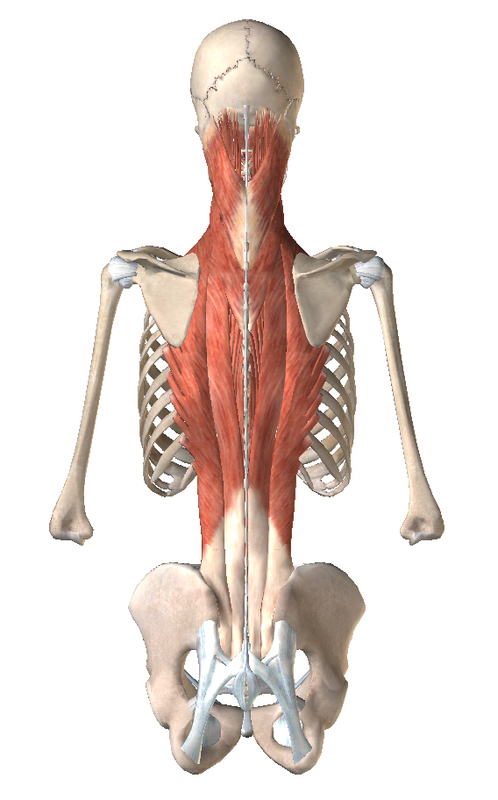 Chronic involuntary contraction (SMA) of all the muscles of the back of the body. 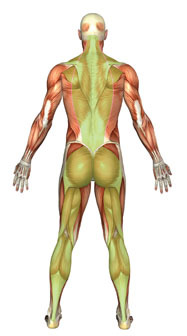 In the image below those muscles are highlighted in green. So what can we do about it? Well in truth the solution is quite simple. 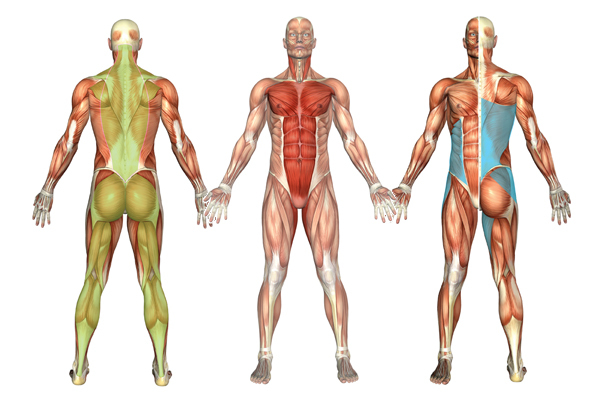 We must RELEARN optimal control of all the muscles of the back of the body. When we relearn proper control we will have the ability to relax and lengthen these muscles to their full and proper resting length. When this has been achieved pain is reduced or eliminated and movement quality improves. How do we relearn proper control of these muscles? We pandiculate them using safe simple Somatics Exercises or through a series of Hands On Clinical Somatic Lessons. If you would like to learn how to release and relax all the muscles of the Green Light Reflex for a looser more comfortable back and freer movement, get in touch here. Poor posture is the result of habituated dysfunctional patterns of involuntary contraction aka Sensory Motor Amnesia (SMA). Or, put more simply, excessive levels of involuntary muscular tension in one place or another that pull us out of shape and cause muscular imbalances. In fact, the Three Reflexes, Green Light, Red Light an Trauma, show up in our bodies as postural distortions. 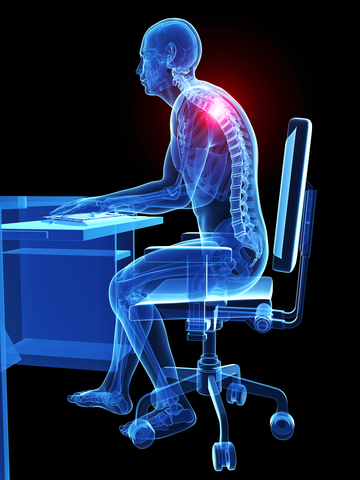 Poor posture as a result of habituated Green Light Reflex, Trauma Reflex and Red Light Reflex. Most people will have all three to some degree. Excessive time spent sitting/driving/doing desk work can lead to SMA in relation to the muscles of the front of the body (Red Light Reflex). You lose the ability to lengthen these muscles to their true resting length. When these muscles are tight they round the shoulders forward, pull the chest, and in turn the head, down and forward into typical slumped posture. 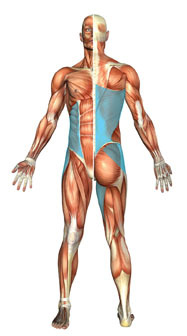 Often, in a situation as illustrated above, the conventional view is that the muscles of the back of the body are ‘long and weak’ and the muscles of the front are ‘tight and short’. Thomas Hanna addresses this fallacy quite specifically and comprehensively in his teaching. The tight side is not weak it is perfectly strong, it is also fatigued. If you palpate a tight muscle you will feel how it is very hard, that is because it is strongly contracted. The perceived ‘weakness’ is a result of the fatigue from being constantly contracted and constantly using energy. There is a difference between being weak and being fatigued. The strength of a muscle is dependant on its ability to contract fully and equally to relax fully. A muscle that never relaxes is always tired and so cannot do its job properly. What about the muscles on the other side that are thought to be ‘long and weak’? The muscles on the opposing side, are longer yes, but again they are not weaker. They cannot contract fully because the opposing muscles are ‘stuck’ in contraction (SMA) as described above. Muscles always work in opposing pairs/groups. If the function of one pair/group is compromised it automatically compromises the function of the opposing pair/group. This is a clear example of Reciprocal Inhibition* for the physios among you. This distinction is very important. When we restore the ability to fully relax, to the ‘tight/short’ side (by eliminating the SMA through pandiculation), the ‘longer/weaker’ side is no longer inhibited and so it can contract fully again. This creates a state of co-ordination and balance between the muscles. With this improved balance and co-ordination improved movement, comfort and posture is inevitable. 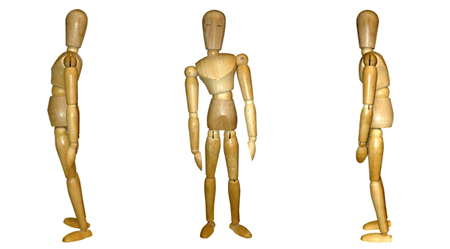 So, good posture, relaxed and tall, is the absence of excessive muscular tension throughout the body and balance and co-ordination between opposing muscle groups. With good posture you will be able to move quickly if you need to, without excess muscle tension. It’s not about tightening muscles in order to stay standing upright! Good posture can be attained quickly and easily through Somatic Exercises. These exercises allow you to eliminate SMA and so remain in a neutral state of relaxed balance. Poor posture cannot be ‘fixed’ by adding MORE tension to muscles that are incorrectly thought to be WEAK! Poor Posture = unnecessary involuntary tension in the body causing imbalance. Good posture = the absence of unnecessary involuntary tension in the body. If you would like to learn how to eliminate SMA and improve your posture using simple Somatic Exercises get in touch. *Reciprocal Inhibition: contraction in a muscle is accompanied by a loss of tone or by relaxation in the antagonistic muscle. Author cgmd1Posted on August 10, 2015 January 8, 2016 Tags back pain, chronic pain, clinical somatics, Dublin, green light reflex, hanna somatics, Health, joint pain, Movement, posture, red light reflex, sensory motor amnesia, slumped posture, Somatic Education, SomaticsLeave a comment on What is ‘Good’ Posture?